Over/Under: Under 145.5 at 1.90 Bet Now! This is the game that many people have been waiting for in the Men’s basketball tournament at the Olympics as it sees the hosts involved for the first time. 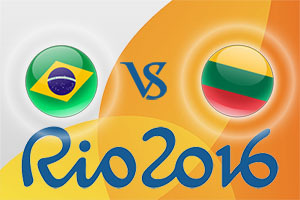 The Brazilian side will have a difficult game in the opening match, Lithuania have plenty of experience to call on but there will be a lot of excitement surrounding this game. An interesting aspect of the match will revolve around Brazil handle the pressure and noise of the crowd. If Brazil are lifted by noisy backing, they could go a long way in this tournament but if expectations weigh heavy on their shoulders, it may be that Lithuania could take advantage of any fear or doubt that is set to come into play for the hosts. This may make it harder to predict what will occur on Sunday but it does make it rather interesting. When it comes to NBA experience, the host nation can call on players like Raulzinho Neto, Cristiano Felicio, Marcelino Huertas, Nene and Leandro Barbosa while Augusto Lima plays with Real Madrid in Spain. For the Lithuanians, both Mindaugas Kuzminskas and Somantos Sabonis are signed with NBA teams and there is a considerable amount of Euroleague experience in their ranks. This means that both teams know how to win games. Will the hosts get through? The bookmakers are of the opinion that Brazil will be able to handle the pressure and can take a victory in their opening game. It is usually of benefit to everyone (bar their opponents) to see the hosts progress in a tournament and if you are backing Brazil at the Men’s Olympic tournament at the Rio Games, you can take them at -2.5, which is available at odds of 1.90. When it comes to the Over/Under market, you’ll find that you can go UNDER 145.5 which is provided at odds of 1.90. It may be that the crowd will drive the home team forward which could create plenty of space and chances but you always get the feeling that the opening game of a tournament for a team is a cagey affair. Bet Now! This game starts at 1815 BST on Sunday the 7th of August.